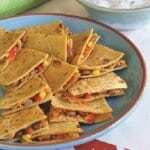 Veggie Quesadillas with Cilantro Yogurt Dip | JPMA, Inc.
Preheat large skillet over low heat (250 degrees in an electric skillet). Divide cheese, corn, beans, cilantro, shredded carrots and peppers between the tortillas, covering about half of each tortilla. Fold each tortilla in half over the filling. Cut each quesadillas into wedges and serve immediately with the dip.